Let me first dispense with the fact that I am not going to be able to tell you what the exact cost will be for building your home. Calculating home building costs includes many variable factors that make it impossible to have one standard formula that fits all home building projects. This said, I can however provide you with the knowledge and information you need to calculate your own home building costs. When calculating home building costs contractors like to quote on a cost per square foot basis. Calculating the cost per square foot on a home building project involves dividing the total cost of the home construction project by the number of square feet in the project. For example, if a new 3000 square home costs $400,000 to build then the cost per square foot is $133. Note that normally the cost of the land is not included in the cost per square foot calculation. Depending upon the home building materials used, the cost per square foot can vary dramatically. If for example you are building a starter-like home with no bells and whistles the cost per square foot could be below $100. If on the other hand, you are building a custom home with a high-end kitchen, e.g. using granite countertops and high-end cabinetry, the cost per square foot of the home could exceed $200. Calculating home building costs can also vary with local home building market conditions as this can affect construction labor rates. One way to get a sense of the cost per square foot on new home construction in your area is to check the local real estate magazines for new home sale prices. 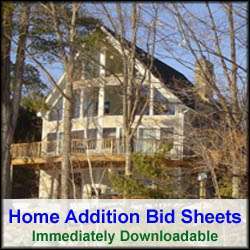 Make note of the new home prices and respective square footage. Also check the real estate magazine for typical building lot prices. By subtracting out the average building lot price from the new home prices, and then dividing by the square footage of the particular home, you can arrive at a typical cost per square foot home building rate for your local area. Keep in mind, however, the type of building material used in the compared new homes. Also realize that building lot prices vary depending upon location, property size and the quality of the lot. Thus the cost per square foot for calculating home building costs in this manner should only be used as a rough reference point. Another major home building cost variable is the shape of the home. For example, a standard two story colonial home can be much cheaper to build than a ranch home of similar square footage. The reason for this is that a large ranch home has a much larger roof and ground footprint, which requires a lot more roof trusses and roofing material and concrete, respectively. In addition a large ranch also requires more land, which may require more lot clearing. Other major variable factors that you must account for when calculating home building costs are local and regional building codes and fees. Many municipalities levy development impact fees that can vary wildly depending upon where you live, and the current home building situation in that area. In addition, covenants and building restrictions can also impact your home building costs and plans. Weather conditions can also impact your home building cost calculations. Poor weather can stop or delay home construction projects, and if not planned and budgeted for properly can impact your home construction’s bottom line dramatically. Every home building cost estimate should include a 5-10% contingency line item to help mitigate weather and other unforeseen cost impacts. Unforeseen ground work can also impact home building costs. If for example, while excavating for the foundation ledge is encountered blasting may be required. By making up front soil samples and site inspections your excavation and foundation contractor may be able to assess ahead of time the need for any blasting. To conclude, when calculating home building costs it is important to identify every phase and feature of the home building project, along with a list of the associated variables. For each phase of the home building project, a complete list of the building materials and labor required should be recorded in a spreadsheet, and alongside each item their associated costs. In addition, a separate line item for each variable, along with an associated cost, should be recorded. By creating this type of comprehensive bottoms up cost spreadsheet, you can most accurately calculate your home building costs.